Marco Polo Davao will kicked-off 2017 with Lets Glow neon themed party at the hotel’s ballroom as it welcomes the New Year. Guests will enjoy culinary highlights, prepared by its Executive Sous-Chef Alex Destriza, during its dinner buffet at its all-day dining restaurant, Café Marco such as the famous prime ribs, roast beef, roasted pork and other Filipino favorites. Cantonese dishes such as the traditional Peking Duck and a wide variety of Dim Sum will be served at the hotel’s Chinese Restaurant, Lotus Court. Chef Alex and the F&B Kitchen Team have prepared signature drinks and cocktails to be offered to the guests at the ballroom. The guests will be also enjoying the night dancing in the music of Reversed Band as they wait for the countdown. Tickets are sold at Php 2,600.00 nett per person inclusive of buffet dinner at Café Marco or Lotus Court, party admission, one round of drinks and one round of pica-pica. For reservations, you may visit our Hotel lobby retail area or call us at 221-0888. 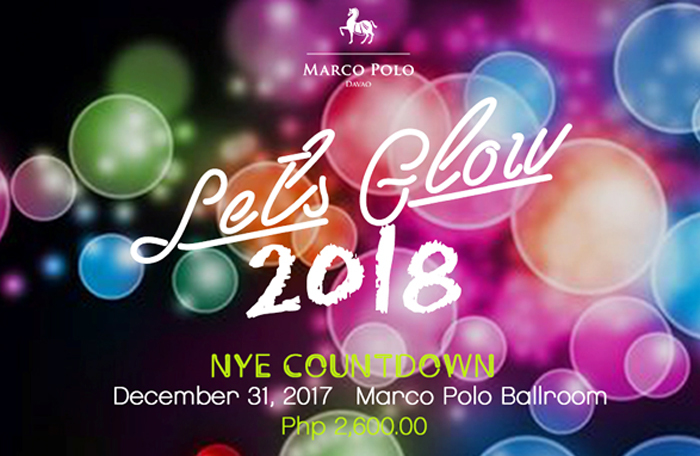 Marco Polo Davao’s Lets Glow 2018 New Year’s Eve countdown event sponsors are Air Asia, Martini, KMI Food Products, Swiss Deli, Papo Screen Graph, Malagos Farm House, Werdenberge, and Multiple K Meat and Poultry Dealer.